For Budworth, Southport's marathon 24 hour race turned out to be an epic weekend with everything: heavy rain to the tiniest glimpse of sunshine, drifting to death rolls, parties to hangovers, setacks and heroism, ultimately to end with trophies and the best aggregate result for the combined Budworth teams ever. All was interspaced with great sailing, comradeship and the togetherness of all who attended, be it visitors, supporting family, sailors, cooks or organisers, this is what makes up this unique event. 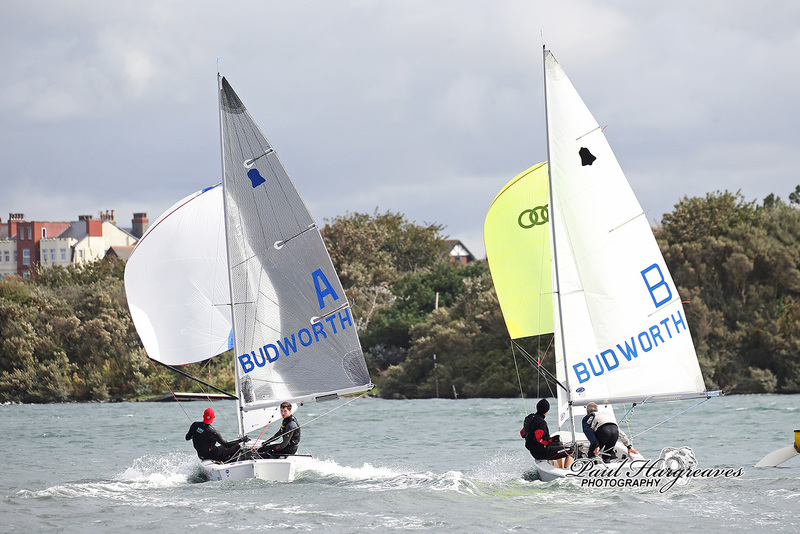 Budworth proudly fly the club and Union flags on shore and use distinctive yellow spinnakers bearing the Audi logo on the A, B and C team boats on the water to recognise the kind sponsorship of Preston Audi. We are always one of the most competitive on the water and social on the shore. But with an increased entry to 77 teams and a hugely competitive fleet, could this be our year? It certainly was socially with Elephant Juice, our own Rob Murphy's band, rocking the sailing club on Friday night and Ali's Budworth Prosecco party on Saturday evening seemingly attracting everyone to our marquee with young Fin ably keeping glasses filled – whether they came for the drink or the company, who knows or cares? The A team got off to a brilliant start with GT and Ellie nailing the reaching sprint and winning the prize of the Radio Merseyside Cup for the fastest first two laps. The new superfast club boat was proving its worth until suddenly the kite halyard started jamming and inexplicably, the mainsheet shredded. Frantic activity from the shore and the problems were repaired but in such a competitive race only a few minutes' stop is costly and the A team were now down to 15th, a mountain to climb even to get back into the top 10. With Budworth's elite sailors all trusting each other to sail superfast, they tracked through the weed, picked the shifts and started to pull through. The pure boat speed demonstrated by Nick and Ali took the prize for the fastest midnight lap and by the morning we were remarkably back in touching distance of the top 5. The wind finally began to fulfil the forecast, building from medium light and by the end becoming a scary 20 + knots with gusts flying in. The youth of Nick and Geoff was called on, hiking to the max to sail flat and fast, risking knock downs as they tacked to follow the shifts with no quarter given for the wind speed, absolutely flying down the run, spinnaker up, somehow avoiding the carnage of capsized boats in kamikaze fashion as nearly everyone else was thinking only of survival. A close rival veered off out of control between D and the shore to take the unluckiest of penalties. The team had gained but was it enough? No one knew for sure as the gun fired for the finish and radio silence commenced from the sailing committee until prize giving. Could the B team, of what appear to me as talented helms too young for the over 50s competition (although I do now think policemen are positively juvenile), together with the cream of our crews, improve from last year's 16th to win the Masters trophy or even dare to dream of a top 10 result? Hugh, as committed to the cause as ever had put his new Winder GP on the line for the team to squeeze out that extra ounce of performance. Martin and Sian started with an absolute flyer, showing at the first published results an amazing 6th. As the race progressed and the positions evened out, could a top 10 position be maintained? All performances were great and Hugh's flying machine was ripping around the track. Jon and Wendy won the dusk race and Martin and Sian were 4th in the midnight race – no shortage of boat speed, then. But it was not all plain sailing; a penalty for a roll tack which was just too enthusiastic (don't you always feel the ref's against you?) and even the best capsizes, with quick recoveries required from more than one crew - one capsize was even captured live on Facebook with a graphic soundtrack just seconds from the finish. 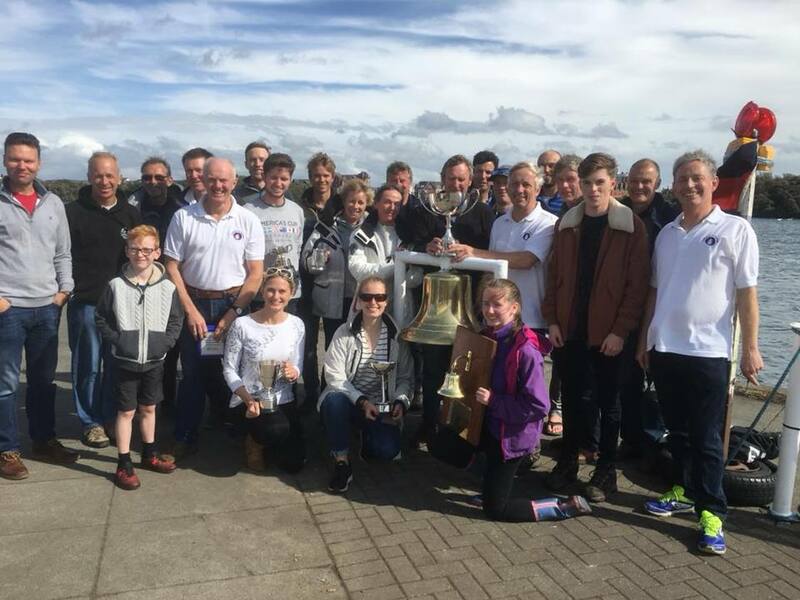 But the sailing from everyone was fantastic and the team posted an amazing 9th place, as well as bringing home the trophy for the Masters' champions. All targets achieved – brilliant! The C team were plunged into chaos just a day from the start with sporting injuries and plumbing disasters suddenly depleting the team to just 5 members. Hugh issued an 11th hour e-mail cry for help. Who possibly could change their plans at such notice? Our heroine turned out to be our unsuspecting Laser-sailing Bernice who kindly arrived planning a nice afternoon sail (helming). Unknown to her, this was to turn into a marathon. By the time she had learned (brilliantly) to fly the GP spinnaker in daylight during her first 5:00 to 8:00 pm session, she had already missed husband Robin's cooked meal at home. Malcolm issued her a survival sleeping bag for the night ahead and, amazingly, she agreed to the most sleep depriving 2:30 am to 5:30 am slot to take her new-found crewing skills forward in the dark. That wasn't enough, however. Unexpectedly, as the wind started to howl again, she volunteered (?) to finish the race with me (Ted) which turned out to be an exhausting and bruising ordeal (sorry and thank you so much). It had all started so well with Simon and Steve picking up from their great performance from the year before when the C team had moved forward from the 50s to 35th. Then the infectiously enthusiastic Charlie and Arianna had a blistering session, pacing at the same speed as the A and B teams and bringing them into the heady heights of the twenties. Long stints from all held the team in position overnight with Charlie and Arianna braving the building wind with some extra help from Rebecca as it got wild. We were in around 25th position with just an hour and half to go. Exhausted, Charlie and Rebbecca handed over to Ted and Bernice. It was all going so well for nearly an hour, but the wind continued to increase and, although we nimbly righted the boat after the first gybe capsize, it become more difficult and energy-sapping with multiple knockdowns before we could empty the boat of water. It all culminated on the last lap with only seconds to noon and the finish. After a chicken gybe around at the leeward mark we bore away too fast and the boat violently lurched to windward sucking Ted out of the boat, bending the tiller and leaving Bernice to career alone across the lake out of control as the boat crashed into a death roll. Massive determination was required to get to and right the boat again and to negotiate the final beat, reach and short run to the finish, with the C team's sails covered in weeds and now resembling something you would see in a garden centre rather than a sailing club. Even the boat was at the end of its reserves with the tiller breaking moments after the boat was recovered (how lucky we were). Had it been blown for the young team? We all gathered at the bar ahead of the prize-giving. We knew the B team had done a great job, but had the A team's epic recovery reaped rewards; had the (mainly) young C team's best efforts been thwarted by the final capsizing session. It was to be answered as 5th and 4th were called out but they weren't Budworth; amazingly, even with the gear failure stops, Budworth A had again achieved 3rd. It was all smiles. Without those problems, could they win? It looks like it's got to be another try in 2019. The B team proudly collected their Masters' trophy, of course to be defended in 2019. 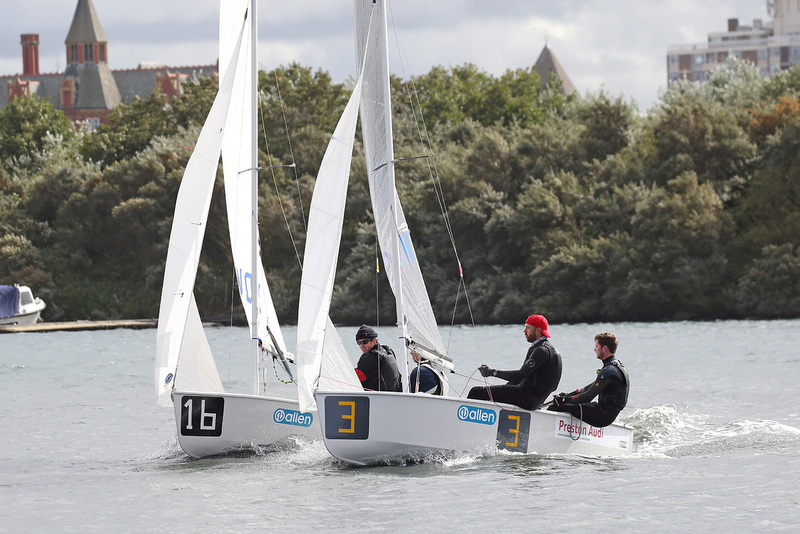 As for the C team, Charlie eagerly obtained the results sheet and, despite the last session, the team had managed to finish 27th, a great performance, particularly for the young sailors. The event simply could not happen without Bill's legendary sausage casserole, Ali's delicious home-made soup, plus the ever-popular flapjacks, Eccles cakes, and chocolate brownies, supplied by Martins Bakery. Jake is brilliant to cook for us and his bacon and sausage sandwiches are a must to restore energy on Sunday morning. The detailed organisation and 24-hour monitoring by the event managers, Chris and Katie, are vital and their constant presence day and night holds the whole effort together. Without Bill's enthusiasm and the help and support of so many people it wouldn't be possible to participate in this prestigious annual event – a massive thank you to all.